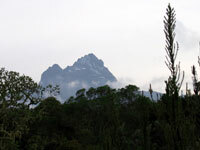 Many people want to enjoy being on Kilimanjaro without going to the summit. This three day hiking itinerary takes you through the montane forest, across the Shira Plateau and high enough on the mountain to enjoy stunning views. 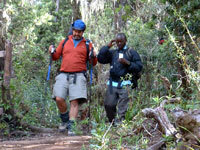 The trip is supported in the style of our mountain climbs with porters to carry your gear, cooks and a guide. You stay in the normal mountain camp with mountain dome tents. Day 1 - Begin trek. In the morning, drive to the starting point of the Shira Route on the southeast side of Kilimanjaro (the trailhead varies from season to season with weather conditions). 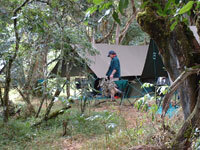 Begin hiking at about 6,400 feet and follow a winding trail up through montane cloud forest . The forest can be wet at any time of the year, so you can expect a real tropical experience as you climb over roots and through giant fern forests with tangled vines and creepers. Day 2 - Shira Camp. Today you climb above the Shira Plateau to 13,000 feet. A steep trail leads out of the giant heather and onto a ridge that commands wide vistas of both the Shira Plateau and the plains to the west. From our exclusive camp you are treated to your first breathtaking views of the Western Breach of Kilimanjaro's summit. Day 3 - Shira Camp II. Continue to trek on the Shira Plateau this World Heritage site. Small trails meander among the giant heather leading across the many small mountain streams that cross this vast bowl. Arrive at the road head for a sumptuous picnic lunch. After lunch drive back to Arusha. This is a nice extension if you want to get a feel for tropical montane forests, an entirely different habitat from the typical safari, and do a bit of walking. In the forest you will see new species of birds and groups of Colobus and Sykes monkeys. 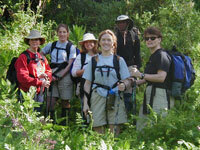 This trip is also good if you want to allow yourself extra time to acclimatize for Kilimanjaro. Day 1 - Arusha National Park – Mount Meru. In Arusha you'll be met by your safari vehicle and guide and proceed to Arusha National Park, about one hour from town. Game drive through the park en route to our deluxe camp. The camp is situated at the base of Mount Meru, a 14,900-foot volcano, and is at an elevation of about 7,500' (which aids in acclimatization for the Kilimanjaro climb). You'll arrive in time for lunch and an afternoon game walk. Day 2 - Mount Meru. 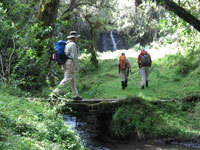 With park rangers as escorts, hike through the forests of Mount Meru to its beautiful crater at 8,500 feet. Meru has a history similar to that of Mount St. Helens in Washington, in that half the mountain was blown away by a violent volcanic explosion. Meru's eruption occurred some 250,000 years ago, though, and great forests of African cedar and podocarpus have since grown up to cover its crater and slopes. The crater is an enchantingly beautiful place: a 12,000-foot ash cone rises menacingly from the crater floor, surrounded on three sides by the vertical walls of the old volcano. On the hike, you'll have the chance to see colobus monkeys, bushbuck and duiker, buffalo, giraffe, and perhaps elephant or occasionally leopard. The forest bird life is excellent and includes touracos, hornbills, and parrots. In the evening, return to camp for dinner and a roaring campfire. Day 3 - Arusha Leave camp and game drive back through the National Park en route to Arusha. Drop off in Arusha at about 12pm.